WINNER - A Bookshelf Monstrosity! Congrats! 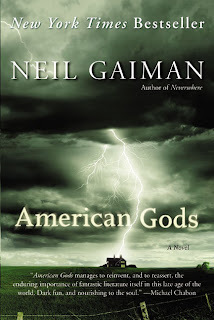 I’m going to hold a quick little giveaway for Neil Gaiman’s American Gods. If you’d like a new paperback copy of the book, just comment on this post with an email address or another way to reach you, and I’ll pick a winner tomorrow at 3pm PST. Open to residents of the US & Canada. After three years in prison, Shadow has done his time. But as the days, then the hours, then the seconds until his release tick away, he can feel a storm building. Two days before he gets out, his wife Laura dies in a mysterious car crash. Dazed, Shadow travels home, only to encounter the bizarre Mr. Wednesday claiming to be a refugee from a distant war, a former god and the king of America. Disturbing, gripping and profoundly strange, Neil Gaiman's epic new novel sees him on the road to finding the soul of America. This book won all sorts of awards, and though I only say I ‘like’ it, rather than ‘love’ it, it’s definitely a masterpiece of dark imagining. For fans of myths, dark fantasy, horror, and the quirky and bizarre. Ooh, after reading "Good Omens" and "Neverwhere" recently, this was on my to do list. This seems a bit different (from what I know of it) than the others, but I definitely want to give it a try! Oh, yes please! love Neil Gaiman! Thanks - I'd love to win this - I loved Anansi Boys, but haven't read this one yet. Me, Me, Me, Me. I let a friend borrow this years ago and never got it back. I would love to have it again. This sounds really neat. I have not yet read any of Neil Gaimans books so this sounds like a great start. Please enter me for the book. This is one Gaiman I haven't gotten to yet so count me in! Throw my name in the hat for this one, please. Thanks! Been meaning to read more Gaiman! Thank you for the contest and the entry!! Would LOVE a copy of American Gods! yesss, loved this gaiman creation too! loved how he incorporated the European characters of yore. the lucky winner is in for a treat! umm, can i get entered? i really would like this book... saw it on the hall chair and was wondering what you were going to do with it. haven't read it, but know i'll love it. plus, there are a mILLIOn holds on this book in the library.